Winnipeg Jets get: defenseman Tyler Myers, forward Drew Stafford, forward prospects Joel Armia and Brendan Lemieux, and a 2015 first round pick. Buffalo Sabres get: forward Evander Kane, defenseman Zach Bogosian, and unsigned goalie prospect Jason Kasdorf. It is not very often that a highly-skilled 23-year-old power forward is available in trade talks. This trade is excellent for Buffalo as Evander Kane is out for the rest of the year having just had shoulder surgery that will require around 4-6 months of recovery time. It's no secret that Buffalo is in the midst of a major rebuild and they just added one of the most dynamic players in the league to a really talented prospect pool. This trade also makes sense because it makes the team worse, and will increase the odds that they have the number one overall pick come lottery time. Kane's possession numbers have always been high but this year has proved to be his best, even though his scoring rate it down. His career average shooting percentage is around 8%, but he's hit a bit of bad luck this year as his shooting percentage is at 5. SCF% is a metric that has recently gained traction as a good indicator of great scoring opportunities with play within a "danger zone" around the net. Putting aside all the controversy that is following him, the numbers show that Evander Kane is a true top-six forward with elite offensive skills. Kane possesses such a unique skillset with his great speed and shot while being a larger player who can use his frame to get to the front of the net. He has yet to play a full 82 game season, which is a bit concerning but he has a chance for a new start in Buffalo. Now we look at the other addition coming to the Sabres in this blockbuster deal. Zach Bogosian is an interesting acquisition for Buffalo because he really hasn’t had a great track record up until this year. He has always been a negative possession player relative to when he's off the ice, but usually plays against a high quality of competition and handles a good portion of the defensive zone starts. Just like Tyler Myers was in Buffalo, Bogosian is going to be on the teams shutdown pairing with Josh Gorges. Buffalo is among the worst hockey teams in history controlling an abysmal 37.1% of play at even strength while being a -1214 in raw Corsi (all unblocked shot attempts) shot differential. Zach Bogosian is going to post very poor numbers there because of how bad of a team Buffalo is and for the fact that he really isn't a top pairing defenseman. The team paid a pretty high price for two these two players, but at the end of the day you got two very attractive assets to have in the midst of a rebuild. This is a next level tanking move by GM Tim Murray to try and lock down the best odds at Connor McDavid. There is not a lot to love when you look at this player usage chart, but that’s the product of a team that was meant to fail. Winnipeg chose two players who can desperately use a change of scenery, and both will help this team as they prepare for a playoff run. One of these players was the rookie of the year back in the 2009-2010 season, Tyler Myers. Myers is a 6'8 beast of a defenseman that adds a ton of size and skill to a loaded defense core in Winnipeg. Myers has had an interesting path in Buffalo by starting off as a rookie phenom scoring 11 goals and adding 37 assists. Was this luck or was this a rookie showing his true offensive ability? Myers had a 102.1 PDO that year which is a good indicator that he had a bit of luck shooting at 11%. That year he also posted a 49.3 CF% at even strength against secondary competition while splitting his time in the offensive and defensive zones. In the 2010-2011 season, he got even better posting 53.4 CF% at even strength but had the benefit of more offensive zone starts against even lesser competition. In the years after he began to struggle as the team got worse and started to embrace a rebuild. He is still a legitimately talented defenseman and this move to the Jets will allow him to play with other talented players in more offensive zone situations. 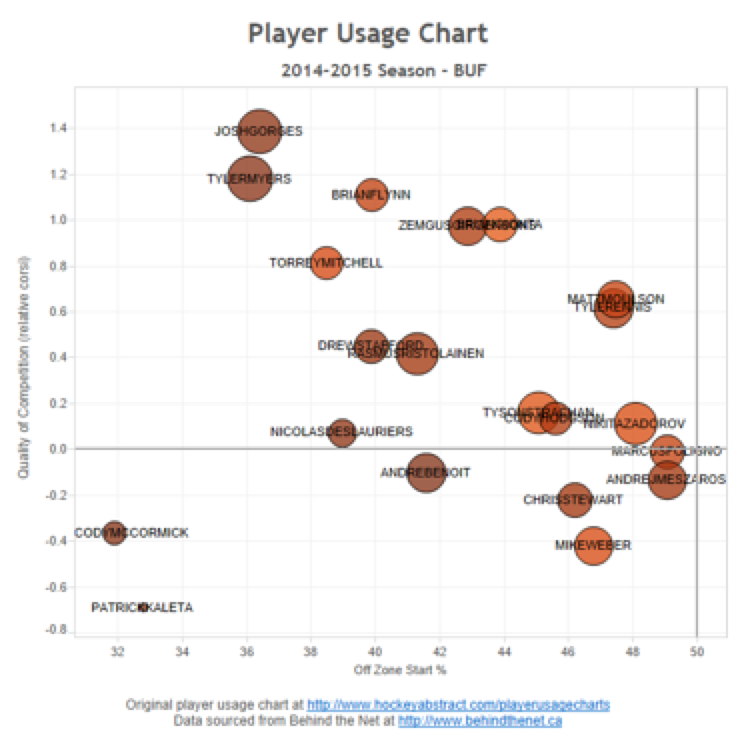 In Buffalo this year he was thrown in the defensive zone in the top pairing against high quality of competition. It didn't help that he was paired with Josh Gorges but he now has an opportunity to be the second or third pairing defenseman on a playoff team. Drew Stafford has always been someone overrated by his incredibly high shooting percentage which resultes in inflated PDO numbers. He's only been over 50% possession once in his career and has usually been negative relative to his teammates. For what Winnipeg will need him to do, I think he is a solid fit. He has always had the luxury to play against the weaker spectrum of competition while having a good share of offensive zone starts. The last few years in Buffalo he was used deployed in different ways. This time in Winnipeg he will probably get a large bulk of offensive zone shifts against bottom-six forwards, so its not crazy to think he can be useful in a situation where he isn't so depended on. Stafford is on the last year of a pretty pricey contract so this is most like a rental as they prepare for the playoffs. Winnipeg also gets two interesting prospects and a first round pick (most likely 25-30). Joel Armia is a skilled power forward who was really improved his play over the last year in the AHL for the Rochester Americans having 25 points in 32 games. Brendan Lemieux is also a quality forward playing in the OHL for the Barrie Colts. Lemieux, like his father Claude, is an agitator who is starting to show some offensive power with 35 goals in 46 games for the Colts. Thomas Andreu writes on hockey for RealGM.